The One Hundred Eleventh United States Congress was a meeting of the legislative branch of the United States federal government from January 3, 2009, until January 3, 2011. It began during the last two weeks of the George W. Bush administration, with the remainder spanning the first two years of Barack Obama's presidency. It was composed of the Senate and the House of Representatives. The apportionment of seats in the House was based on the 2000 U.S. Census. 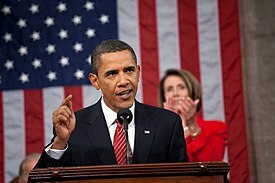 In the November 4, 2008 elections, the Democratic Party increased its majorities in both chambers, giving President Obama a Democratic majority in the legislature for the first two years of his presidency. A new delegate seat was created for the Northern Mariana Islands. The 111th Congress had the most experienced members in history: at the start of the 111th Congress, the average member of the House had served 10.3 years, while the average Senator had served 13.4 years. This Congress has been considered one of the most productive Congresses in history in terms of legislation passed since the 89th Congress, during Lyndon Johnson's Great Society. Inauguration of Barack Obama at the U.S. Capitol, January 20, 2009. 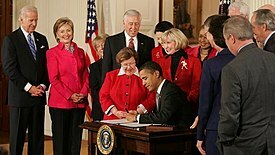 President Obama signing the Lilly Ledbetter Fair Pay Act of 2009 into law, January 29, 2009. Sonia Sotomayor testifying before the Senate Judiciary Committee on her appointment to the U.S. Supreme Court, July 13, 2009. President Obama addressing Congress regarding health care reform, September 9, 2009. 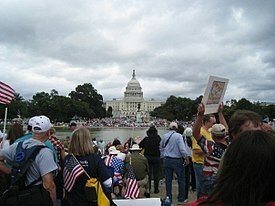 Tea Party protests in front of the U.S. Capitol, September 12, 2009. 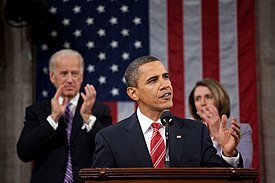 President Obama delivering the 2010 State of the Union Address, January 25, 2010. 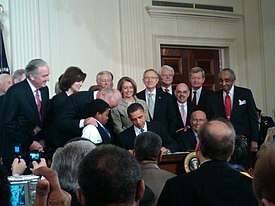 President Obama signing the Patient Protection and Affordable Care Act into law, March 23, 2010. 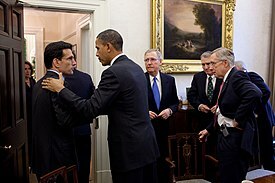 Congressional leaders meeting with President Obama, November 30, 2010. President Obama signing the James Zadroga 9/11 Health and Compensation Act of 2010 into law, January 2, 2011. Despite uncertainty over three high-profile Senate seats, Congress is hoping to move quickly on a number of fronts, The Times's Carl Hulse reports. Jacob Straus: "Party and Procedure in the United States Congress"
Speaker Pelosi and the Members of the 111th Congress were sworn in on the House floor today, January 6, 2009.